A Toronto local is jazzing up the "Neighborhood Watch" placards of the city. Andrew Lamb's affixing superheroes, action stars, and everything else under the sun to the signs. 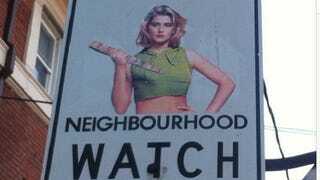 Who'd mess with the neighborhood protected by Buffy? I walked by and thought those signs would be much better with a superhero up there. The first one was a splash page — a common thing in comic books, a bunch of superheros popping out at you. Then came Batman and Robin, RoboCop, Beverly Hills Cop, and then it snowballed. What I'm doing is technically illegal, but I don't feel it's ethically or morally wrong. So there might be a fine some day but I kind of feel like that's money well spent. I'm not that worried about it. ... I hope it's just spontaneous nostalgia and happiness, The kind of vandalism you can bring home to mom.